"Daring and unafraid of tackling hot and sensitive issues..."
"...asking questions no one else asks, and printing what others hide." "Critical, truth-telling, truly independent, and free-thinking publication at a time when others offer apologia and false praise for all Arab cultural productions." "Predictable only in terms of the broad diversity which you discover in its pages..."
"...owned by no corporation, and accountable to no one but to its readers..."
In a recent media review article published in the Nation magazine, novelist and former New Yorker magazine correspondent Amy Wilentz wrote, "So I was led reluctantly to the magazine, but when I looked into its back issues, I discovered that it contains a wealth of opinion and information that no one else is publishing in English." 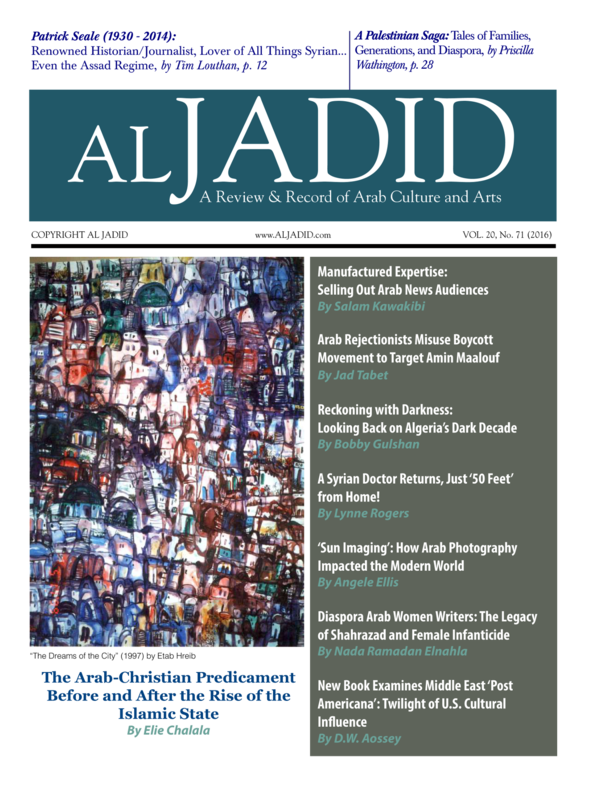 She adds, "Magazines like Al Jadid, which are concerned with niche obsessions or particular groups, also often speak with unintentional authority to the universal, to the general human experience"
A magazine size publication with an average of 40 pages in each issue, AL JADID is published in English, and features original articles along with many translations of essays and interviews by Arab writers, journalists, scholars, and poets as well as original illustrations by featured artists. 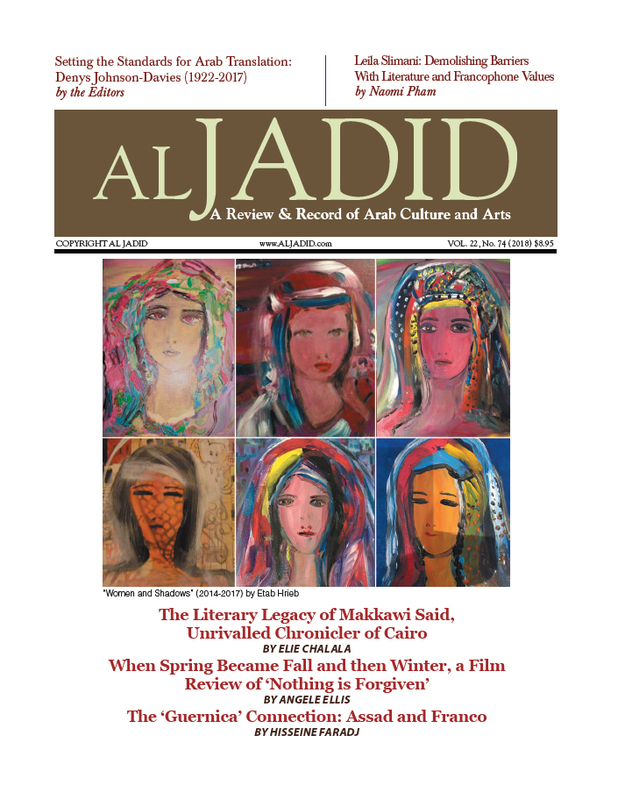 Many leading Arab writers, from both the United States and from the Arab world, contribute to AL JADID. Much of what you read in AL JADID challenges conventional approaches to Arab culture and arts. We have covered scores of Arab intellectuals and artists under fire from the state or extremists; most recently, AL JADID offered extensive coverage of the cases of Egyptian sociologist Saad Eddin Ibrahim, Kuwaiti author Laila al-Othman, Syrian novelist Haidar Haidar, Moroccan author Mohammad Shukri, Lebanese composer Marcel Khalife, and the community of Algerian intellectuals and journalists, to mention just a few. At the heart of our coverage is a concern with the sanctity of Arab intellectuals and artists and a fierce defense of those whose pens were treated as weapons. 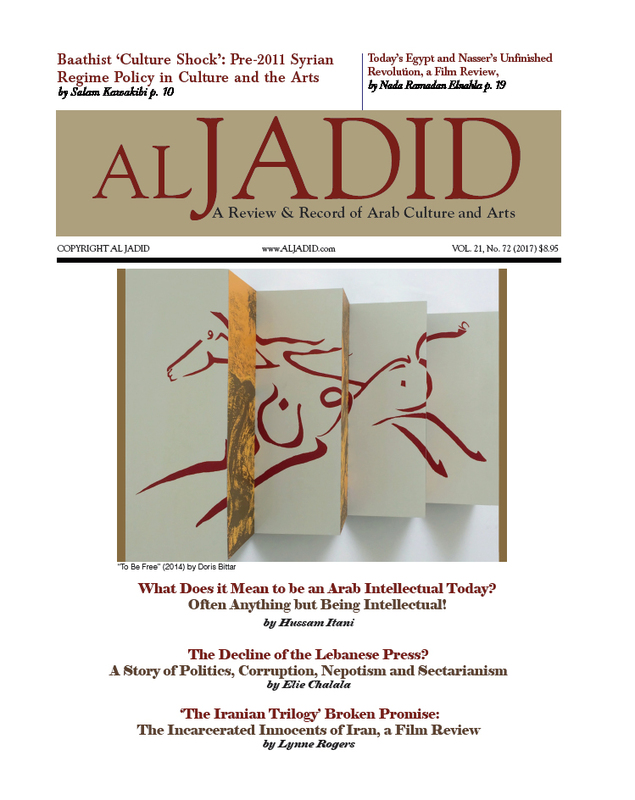 AL JADID also continues to distinguish itself by its breadth of coverage, its timely book reviews, translations, and the originality of its articles on diverse topics from music to theater, books to journals, fiction to fine art, poetry to performing arts, as well as intellectual discourse ranging from the historic to the contemporary. 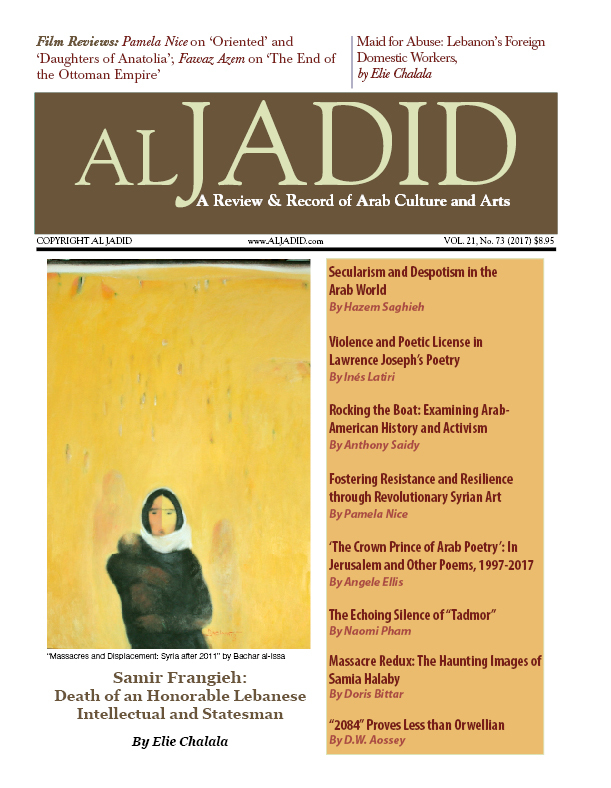 AL JADID regularly publishes scores of reviews of the latest books on the Arab world and Arab America, across all scholastic disciplines. AL JADID's book news and reviews extend also to books published in Arabic, as well as offering the latest overview of Arabic books in the English language, a section that made the magazine a valuable source to librarians and scholars. The translation section has grown steadily in terms of quantity and direction. We do not wait years to translate an article until the author becomes recognized, whether in Western or Arab media. Relying on a team of editors and experts who monitor the Arab cultural scene on a daily basis, we deliver important voices while their words are still news. In the age of print syndication, with a surfeit of re-circulated articles and features, both in print and through on-line publishing and posting, we are proud of our policy to publish only new and original material that has never appeared elsewhere in the English language. Our purpose is to provide the reader with fresh ideas, that means only the new and in Arabic, that means AL JADID. The editor of AL JADID, Elie Chalala, is an adjunct associate professor of political science at Santa Monica College, where he teaches politics of the Middle East. He has published articles on Middle East issues in books, professional journals, and in national and international publications such as the International Herald Tribune, Philadelphia Inquirer, the Atlantic Journal, the Boston Globe, St. Louis Post-Dispatch, The Oregonian, In These Times, The Humanist, and others. Covering the rich field of Arab arts and culture, Chalala says, has been challenging on two fronts: "In the U.S. we've had the demonizing and marginalizing of Arabs; in the Arab world, we have censorship issues, wars, civil strife, the vestiges of the colonial mentality, and the endless peace process. All of these factors impact and shape culture, and often find their most poignant, elegant expression in the arts." Chalala, who has encouraged emerging writers to participate in the shaping of AL JADID, seeks to maintain high journalistic and literary standards. "Arab media have often been dismissed for not delivering credibility," he said. "If we are to be taken seriously, we must remedy this." Despite the obstacles, Chalala is optimistic: "Our challenge is to increase the awareness that Arab arts and culture continue to flourish, despite the many obstacles in the United States, the Arab world and elsewhere. In the Arab world, literature is flourishing, despite the various restrictions on freedom of expression, from both governments and reactionary elements in Arab societies. 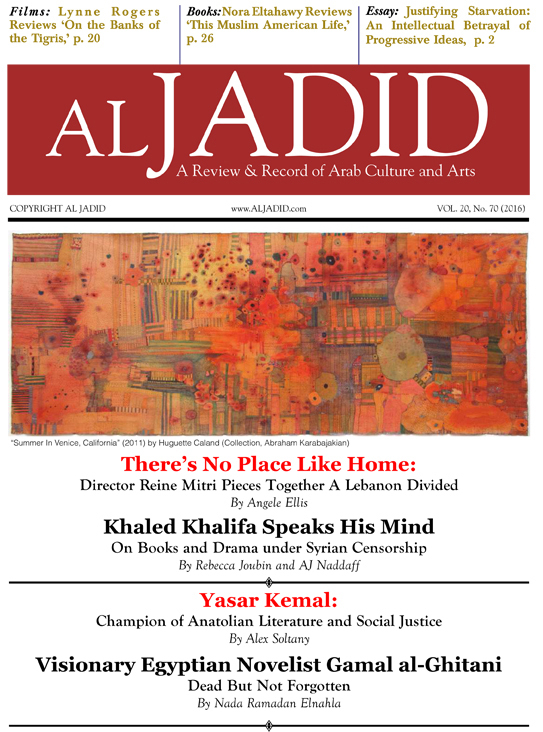 AL JADID is committed to bringing state-of-the-art coverage of all these dimensions of the Arab cultural scene, and has distinguished itself with lively debates between secular and religious, traditional and modernist voices." With editorial offices in Los Angeles, the AL JADID staff consists of April I. Decker, associate editor; Angele Ellis and Lynne Rogers, contributing editors, as well as a professional editorial committee. Production is done by International Desktop Publishing. 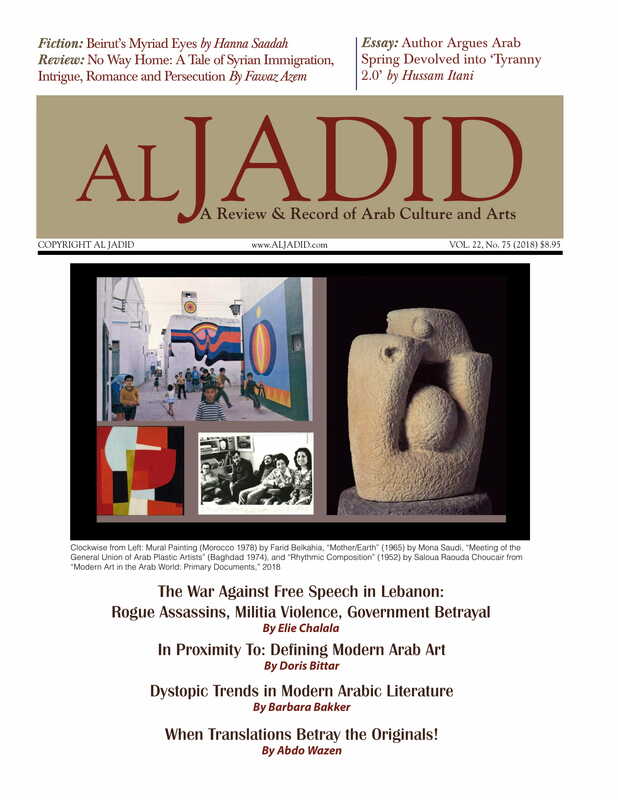 First published in November 1995 as a monthly, AL JADID switched to a quarterly format in 1997. AL JADID accepts very little advertising, in keeping with its policy of not being obligated to any corporate interests. However, the costs of publication continue to rise, Chalala says. Despite the fact that the entire magazine is virtually done as a "labor of love," with writers and editorial staff all contributing their services, the costs of putting out a quality product are enormous, especially with improvements, such as a recent upgrade to a better quality paper. "AL JADID is becoming known and respected nationally and internationally," Chalala said. "This is because of the caliber of our contributors. But we need more people to subscribe, and to help make others aware of AL JADID." The publication is currently available in many major university libraries, and a select number of independent bookstores. However, an increasing number of people contact the AL JADID offices to purchase copies. The following subscription terms apply inside the U.S. only: Annual (2 issues) subscription for individuals is $28; institutions, $40. Canadian subscribers add $10 to the annual subscription rates to cover overseas shipping; all other overseas subscribers, add $14 to the annual subscription rates.